We specialize in offering a comprehensive range of repair services for your garage door. Whether you're dealing with a malfunctioning opener, a worn-out set of torsion springs, or require expert maintenance, our team will be on hand to help you out. Dents can become pretty problematic, whether they appear in your door panels, the rails or the tracks. These dents can easily appear and can make it difficult for the door to move smoothly - in turn this causes an increase in wear and tear, leading to more severe problems down the line. Our technicians can quickly remove dents from all the metal parts of your door and replace any components that have been badly damaged. Investing in a new door for your property can be an excellent idea, bringing increased security and curb appeal to your home. We offer installation services for new doors, and we work with the best manufacturers in the industry; Clopay, Windsor and Amarr, to name just a few. Our team can install your new door thoroughly and won't complete the job before testing it and guaranteeing that it works smoothly and safely from day one. The most complicated part of your door, the opener, can develop a range of different faults over time. Our team knows exactly how to handle these problems, and can provide a reliable repair service for any malfunctioning opener unit. We also provide and install new units from top manufacturers such as Chamberlain, Liftmaster and Genie - our team provides expert guidance to help you choose the perfect new opener for your garage. 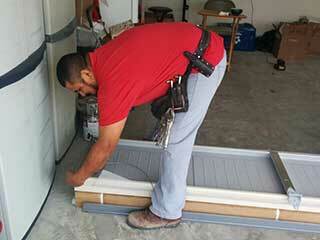 If you’re looking for a service you can rely on, simply our team at Garage Door Repair Little Elm can help. We can handle any problem, large or small. Contact our team today to find out what we can do for you.